Announcement: don’t forget that the first paper is due next Tuesday 10/3 by Midnight EST. See the assignments page if you need another copy. Note that the ACE Center in Lehman’s Old Gym is open from 10-2 on Saturday if you need last minute help with your paper. For help formatting sources, Purdue U’s online writing lab (OWL) is one of the best, most trustworthy sources. For the visually inclined, see their YouTube playlist. For Tuesday, October 3, Read pages 55-107 in Ernesto Quiñonez’s Bodega Dreams. Continue following the major themes of the book and refer to the questions from last week for guidance. Also begin to look at how characters evolve and change over the course of the book. Finally, mark what you think might be key turns in the plot (storyline) and significant developments. For Thursday, October 5, Read pages 108-157 in Bodega Dreams. 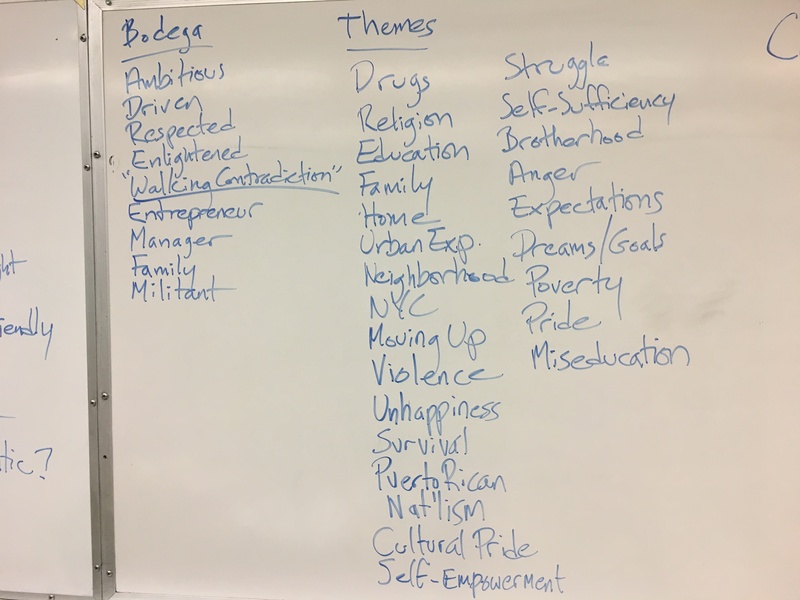 Continue following the key themes and characters outlined. 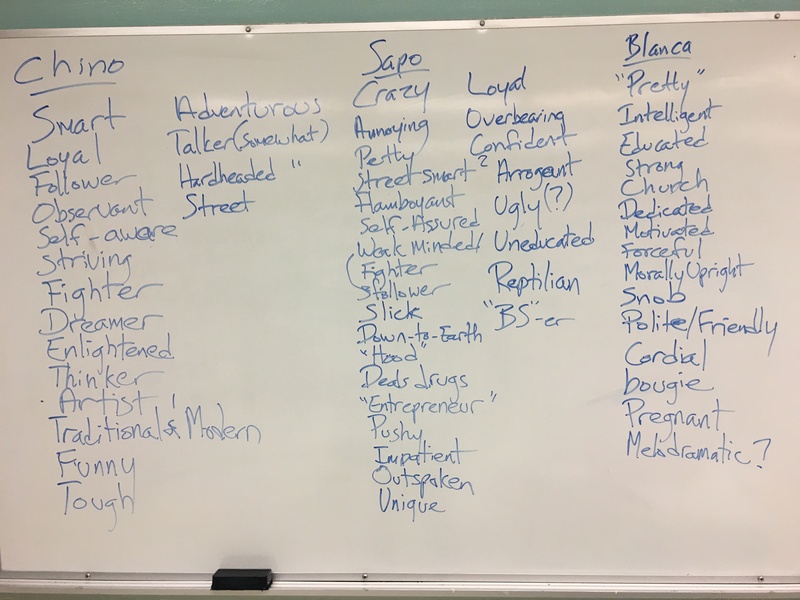 Highlight/underling passages of the book that you think show good examples of these themes or changes in key characters. Thursday April 2: Bodega Dreams conclusion and VOTE!! For Thursday April 2: Read pages 107-213 (end of book) in Bodega Dreams. We’ll start with a presentation by Elijah, Breonna, and Pretiva. Now for the fun part. I’m switching up the film I usually show and have boiled the numerous possible candidates down to a few finalists and I’m kicking the decision to you to vote for the one you want to see. What I’m looking for is something that shows NYC neighborhoods (or at least a neighborhood) with several outdoor shots, intersects with at least some of the themes we’ve seen, is in the time period we’re looking at but old enough to show a NYC that’s probably unfamiliar, and, honestly, I have or can get my hands on easily. It’s a quasi-scientific process with a heavy does of gut instinct. So here are the options: Spike Lee’s Do The Right Thing and Walter Hill’s The Warriors. I was also going for something that’s not too dark or depressing. Here are trailers for both films, courtesy of YouTube. After that, make your choice with the poll below! One vote each (and current students only, please). The poll will close next Wednesday before class. Announcement: Aura Rodriguez from our class is involved with the following play that will be performed at Lehman next week. Details follow if you want something to do on-campus before spring break. Details are at their website. For Thursday, March 26:, we move to the first novel of the semester. Read the first half — pages 1-107 — in Ernesto Quiñonez’s Bodega Dreams. Presentation by Amanda, Neralda, and Victoria. 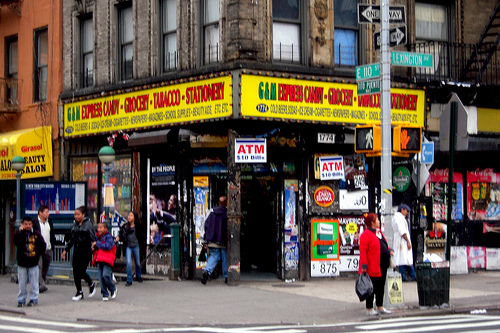 This week, we continue reading Ernesto Quiñonez’s Bodega Dreams. Be sure to take notes of key points and underline specific passages of the book that are good examples of them as you read. Be sure to take a look at the revised syllabus. Also, the new date for the midterm is Wednesday, March 26th in class. Do not miss it and make sure that you’re on time that day!. I’ll go over the exam format in class. For Monday 3/17: Read pages pages 55-107 in Bodega Dreams. For Wednesday 3/19: Read pages 108-157 in Bodega Dreams. For Tuesday 10/1: Read pages pages 97-146 in Ernesto Quiñonez’s Bodega Dreams. For Thursday 10/3: Read pages 146-213 (end of book) in Bodega Dreams. Note: After we finish this book, we move on to Amiri Baraka (then known as LeRoi Jones)’s Dutchman and The Slave. Please make sure that you have the book by then.